You probably know these cookies or have seen them all over Pinterest, in fact I have few different recipes of them in my folders. They have attracted my attention quite some time ago and I’ve been thinking of one day making an effort to bake my masterpiece. Now I am glad I did. So, the holidays may be over, but this seriously impressive dessert is giving me a reason to bake and celebrate winter. I was very surprised by the ease of the process and deliciousness of the end result. My daughter has helped me a great deal and we had a lot of fun baking. These “peach” cookies are beautiful, and Cooking Melangery is all about beautiful food. Lets start new year with creatively delicious treat! Serves: 1½ dozen peach cookies, each the size of a small peach. Although, the recipe calls for liqueur, it is actually very mild and you cannot taste it as it evaporates when the sugar dries. 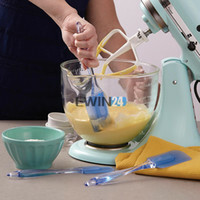 Place the eggs and sugar in a bowl and beat with an electric mixer (using whisk) until light and pail yellow, about 3-5 minutes. Add the oil and beat until creamy, then mix in the milk, vanilla extract, orange zest and Grand Marnier liqueur. In the large bowl mix together the flour, the baking powder and salt, then add this to the batter and beat just until it is combined to form a soft (but little sticky) dough. Take a small amount of batter in your wet hands, and roll into a ball about 1 inch and place these on the baking sheets. I bake 12 cookies at the time, they come out all puffed up, so leave a good space between them. Bake the cookies for about 15-20 minutes. The cookies should be pale in color and not at all golden. As you take the first tray of cookies out, put the second one in the oven. To make a cream: In a medium bowl, whisk the butter with Dulce de leche until smooth and creamy. Add the rest ingredients foe cream and stir until incorporated. The fun part - assemble the cookies: You will need 3 bowls: one with liqueur and red coloring, second with liqueur and yellow coloring, and third with sugar. Fill each cookie hole with enough butter cream filling that it covers it (about a teaspoon). Press the two flat sides of each half together and gently wipe away any filling that comes out at the edge. Brush (using a small brush) each peach with a red food coloring mixture, then with a yellow food coloring; gently roll it in sugar and place on a large plate or tray. I store my cookies in refrigerator until the tea time. Decorate them with mint leaves just before serving. Leave them out at room temperature for about 10-15 minutes before serving. Oat Bran and Nuts Cookies with Dry Cherries and Chocolate Mushrooms – Have a Little Fun! So pretty and tempting! I love those. I have been tempted..but yours take the cake! You did an amazing job, Yelena. These peach cookies look way too cute!